A 2010 waste characterization study of Connecticut’s waste stream found that food scraps were the single most common recyclable material (13% by weight) of the state’s disposed solid waste. In fact, almost one-third of the state’s annual contribution to landfills is made up of food scraps and other organics like yard trimmings, food residues, and compostable (soiled and otherwise unrecyclable) paper. These numbers prompted Connecticut to enact a recycling mandate for certain organic materials, which came into effect on January 1, 2014. In fact, Connecticut became the first state to mandate food scraps generated by large-scale generators be recycled when it passed Public Act 11-217 in 2011. The law was updated and expanded in 2013 by Public Act 13-285. These two bills constitute the whole of the organic recycling mandate and amend Section 22a-226e of Connecticut’s Solid Waste Management Statute. Connecticut’s Department of Energy and Environmental Protection (DEEP) is the regulatory body responsible for enforcing the mandate. CT DEEP provides information on all associated laws, regulations, permitting requirements, and general information about composting on their website. Connecticut already had a number of composting facilities due to existing mandatory leaf and grass trimmings recycling programs. According to Diane Duva, a former Assistant Director of the Waste Engineering and Enforcement Division at CT DEEP, there were three key steps in setting the stage for Connecticut’s organics recycling mandate. 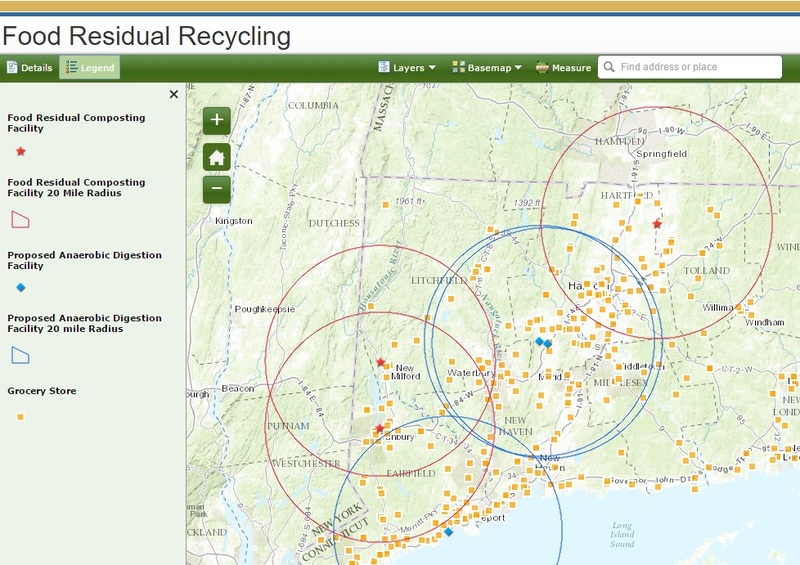 Step 1: Connecticut created a GIS-based map and database of the state’s large-scale food scrap generators to demonstrate that there would be sufficient volume to sustain full-scale processing facilities and map the location of generators that could potentially supply those facilities with feedstock. The mandate requires that generators source-separate their organic materials, then either (a) compost or treat source-separated organic materials on-site using permitted equipment, or (b) ensure that such source-separated organic materials are recycled at an authorized source-separated organic material composting facility. Permitted composting facilities that receive these source-separated organic materials are required to report a summary of fees charged for the materials to the Commissioner of Energy and Environmental Protection as a part of their reporting responsibilities. Generators are affected by the mandate if they are located within 20 miles of an authorized source-separated organic material composting facility, but only if the facility has available capacity and is willing to accept such material. The CT DEEP encourages—though does not at this time require—institutions such as schools, universities, and prisons to recycle food scraps, due to anticipated disposal cost savings. They also encourage the prioritization of food waste reduction and recovery over food scrap recycling.